Don’t be a neigh-sayer. Below, watch the official third season trailer for the animated BoJack Horseman TV show, premiering on Netflix, Friday, July 22, 2016. BoJack was a TV in the ’90s. Now with a new hit movie, he is an Oscar contender, dealing with (and complaining about) all the trappings, questions, and consequences of fame. Will Arnett stars as BoJack Horseman. Amy Sedaris voices his agent, a cat named Princess Carolyn. Alison Brie, Aaron Paul, and Paul F. Tompkins also star. BoJack Horseman was created by Raphael Bob-Waksberg. Guests in past series include Stanley Tucci, Patton Oswalt, Maria Bamford, Kristen Schaal, and Lisa Kudrow. Netflix’s BoJack Horseman Season Three Mane Trailer Is Here! The season three trailer for BoJack Horseman is here and BoJack is a bona fide movie star! 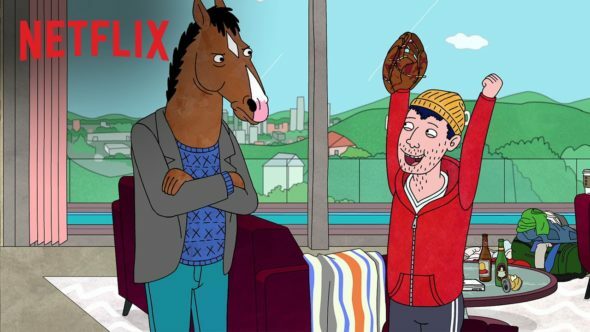 BoJack Horseman season three launches on Netflix Friday, July 22, everywhere that Netflix is available. What do you think? Have you watched the first two seasons of the BoJack Horseman TV series? Do you plan to stream the third season, when it drops to Netflix?